Searching for Knowledge (or just checking Facebook) !! The Metropolitan Museum of Art, located in New York City, is the largest art museum in the United States and one of the ten largest in the world. 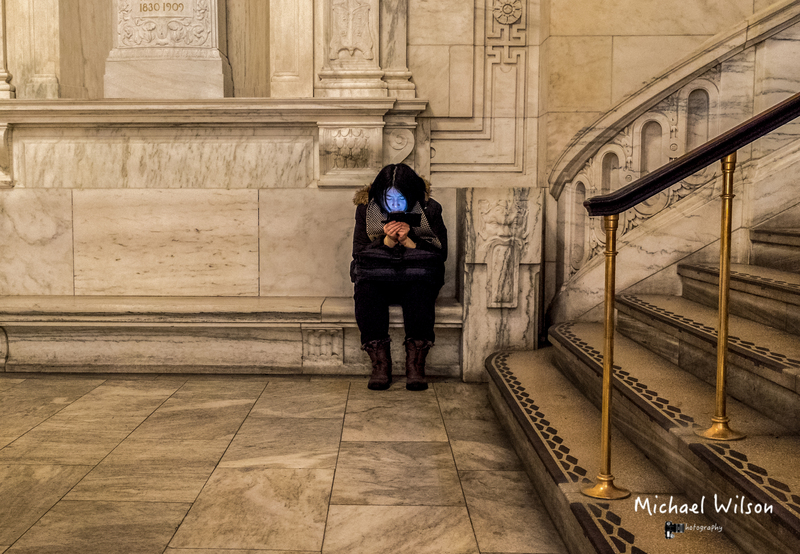 This entry was posted in Photography, Travel and tagged architecture, City, colour, knowledge, Lightroom, Metropolitan Museum of Art, New York, New York City, People, Photography, Street Photography, travel. Bookmark the permalink. I love your work. I have seen such progress as you’ve refined your style. Thank you so much George,I strive to learn something new and try new things. I get lots of inspiration from all the people here on wordpress. Thank you so much for such a wonderful comment. Michael, wonderfully captured. There is a fascination about the light that is cast onto a person’s face from an electronic device. It is similar to a TV but more intimate. Thanks Allen, I found it quite ironic that she is surrounded with such knowledge and history, in a beautiful building though she is so engrossed in the electronic device. I think it tells a tale of todays society. You took my thoughts exactly. Great photo! She went to a museum and ended by becoming an exhibit! 😉 Very nice work, Mike.